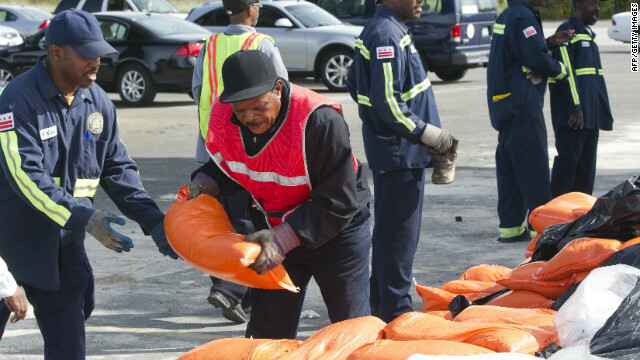 A Department of Public Works employee hands over a sandbag at a distribution center near RFK Stadium in Washington DC on Saturday. (CNN) – As I write this post from Arlington, Virginia, just over the river from Washington, DC, my neighbors and I are getting ready to experience the storm currently known as Hurricane Sandy. I say 'currently' because it will soon lose its tropical characteristics as it merges with a cold front coming in from the west. If that forecast continues to hold, Sandy will become a hybrid system. Many fear that combination will lead to the formation of a "superstorm." Meteorologists are using words like 'unprecedented,' 'historic,' and 'record-setting' to describe what's about to happen to the US East Coast.